Stráže /meaning: Guards/, as its name suggests, originated as guard settlement protecting Hungarian borders. The oldest written mention dates back to 1276. Its history and economy were tightly knit with its neighbours – Spišská Sobota, Poprad, Veľká and Matejovce. The township had an agricultural character. Craftsmen worked here only to cover demand of local inhabitants. It is interesting that property would not be subject to succession, but it would be rather sold among the surviving family members. A mill was raised on the Poprad River around 1758. In the same year there were 80 burgers, 21 tenants, 73 farm servants and 220 children in Stráže. A new mill was built in 1848. In 1927 it was acquired by Jozef Girgaš who was the last mill owner till its nationalization in 1949. In 1940 Stráže had 778 residents, in course of 1944 – 1945 about 300 residents of German nationality moved away from Stráže. In 1952 here was established a common agricultural co-operative. Stráže inhabitants maintained traditions and conducted rich spiritual life. In 1927 the Roman Catholic Church built a monastery next to the original Gothic St. John the Baptist´s Church of the 14th century for the Order of Redemptorists. The square prides itself upon an outstanding Immaculata sculpture (1724-1730), which was reconstructed in 2005. The Reformation ideas started to penetrate here around 1527 as one of the first places in the Spiš region. In 1784 a masonry Evangelic Classicist church was built here. The Town Hall reconstructed in 1996 is located in the municipal square. 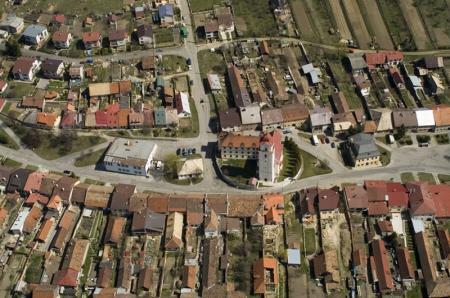 Stráže is currently known among its neighbours as town ward with rich cultural-social life. Its theatre assembly of Ozvena is very successful. First theatre performances were given by the assembly at 1896 Easter in the German language. One of the founders of the Slovak theatre was Július Maličký (1901-1978). He was a trained tailor enchanted by theatre. First theatre performance was ´Kamenný chodníček´ (´Stone path´) in 1919. Since then a tradition has been established in Stráže under which theatre performances have been traditionally held always at Christmas and Easter. In 1920 Július Maličký became a member of voluntary fire unit and in course of 1930-1945 he was appointed its commander-in-chief. The fire unit has a long-term tradition in Stráže, dating back to a period before 1863 when a common fire unit was founded by the inhabitants of Matejovce, Spišská Sobota, Poprad, Veľká and Stráže. This fire unit was conducted by a common, and extraordinarily active commander-in-chief Eduard Blasy (1820-1888) from Veľká. This voluntary fire unit along with the fire unit of Spišská Sobota is the most active in the town and district of Poprad. The township also has several sports clubs. The most outstanding sports personality is Peter Bondra, the famous hockey player who spent his childhood here.